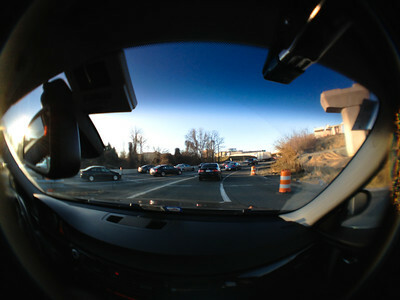 January 3, 2012 - Commuting fun. Wasn't really ready for this today. I suppose that neither was anyone else. Photo Notes: Another iPhone with iPro fish-eye lens. ISO 64, 1/320 second @ f /2.4. Had the phone mounted to a spring clip using the iPro case which has a screw mount adapter for standard 1/4-20 thread. You can see a bit of a clip in the upper right hand side of the photo. The clip was wedged under the passenger side visor. I was using the headphone "+" button as a remote trigger. I was trying to be careful about adding distractions in the car. The phone was far enough away that it wasn't in my field of view, and I couldn't see the screen while I was driving. So, no temptation towards chimping - just shoot and hope. What would I do better next time? I suppose the easy answer is "use a better rig" but, really, the iPhone is a nice size here - it was relatively unobtrusive and non-distracting. The remote trigger capabilities of the headset worked well. I could trade the fish-eye for the wide lens, something to try next time. The clip probably needs a bit of tuning; I'd like to not see it in the frame, first, and second, I'd like to have everything a bit more secure, rather than just thrown together and wedged into the visor, as it was. This was a ten minute hack with available hardware. I did actually use a screwdriver at one point to assemble things, but only to tighten the 1/4-20 screw down enough that it didn't randomly fall out. Also - guess I need to give the car a wash. Hmmm.